I used to beat myself up for everything, even when I’d do a good job. Because, you know, I could always do better. And any time I’d make a mistake, big or small, I’d feel like I just committed a mortal sin. All mistakes were magnified and the guilt and shame made me want to crawl under a rock. Making mistakes became a gnawing cycle that also chipped away at my already unstable self-esteem. Saying no to someone was painful, and there were many times that I just wanted to be alone. 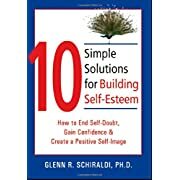 “Pioneering self-esteem researcher Morris Rosenberg asserted that nothing is more stressful than lacking the secure anchor of self-esteem,” according to Glenn R. Schiraldi, Ph.D., author of The Self-Esteem Workbook and a professor at the University of Maryland School of Public Health. In my case, this was certainly true. My low self-esteem led to several toxic relationships, extra stress and a sinking mood. And along the way, I just didn’t enjoy myself as much as I could have. “People even put on a false front to impress [others],” he said. Failure can be especially tough on people with low self-esteem. According to Schiraldi, they experience more shame than others. Wholesome self-esteem is the conviction that one is as worthwhile as anyone else, but not more so. On one hand, we feel a quiet gladness to be who we are and a sense of dignity that comes from realizing that we share what all humans possess — intrinsic worth. On the other hand, those with self-esteem remain humble, realizing that everyone has much to learn and that we are all really in the same boat.